Miraculous Agitations: Radionics Radio Application v.1 Goes Live! Radionics Radio Application v.1 Goes Live! A small but distinguished audience bore witness to the first ever presentation of the fringe science of radionics at the Science Museum last Friday. Radionics has long since been at odds with established science, so the convergence is quite significant. Admittedly, it was unofficially sanctioned: the exhibiting of the Delawarr radionic broadcasting instrument was carried out under the umbrella of Resonance FM, temporarily installed in Aleks Kolkowski's Exponential Horn room at the museum. The presentation formed part of my Radionics Radio launch show (featuring fringe-science expert Mark O. Pilkington) - an exciting new experimental project that pushes electronic sound to/beyond its limits! More on that in a moment... 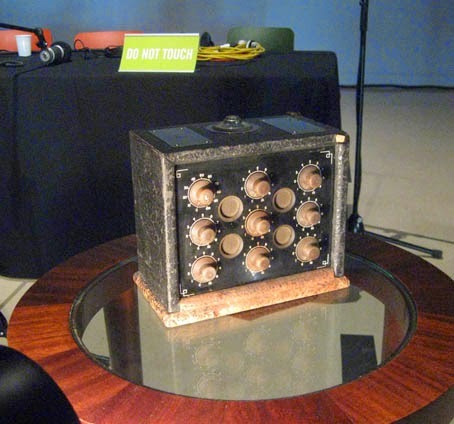 But you may be wondering: what is radionics? In America, radionics is often termed psionics - the psi prefix emphasising the psychical aspect. 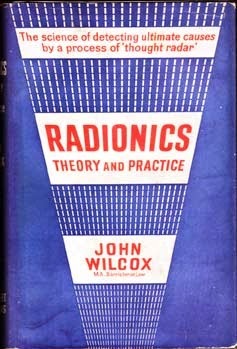 Radionics began as a method of diagnosing and treating illnesses, but gradually expanded its application to agriculture, mineralogy, finding faults in cars (as described in Bruce Copen's Radiesthesia for Home and Garden), making wishes, and finding lost aeroplanes, and is now bewilderingly wide-ranging in its scope. General radionic theory posits that it is possible to embody a thought or concept as a run of numbers or frequencies. The most important component in a piece of radionic equipment is the user. The user thinks of a thought, rubs his/her finger on a detector pad - a smooth or slightly rubberised surface - and at the same time turns a control until a 'stick' or some friction is intuited by the user. This indicates the control's position now corresponds to the thought, and the other controls are positioned in the same way. Radionics is characterised by the use of elaborate electronically-styled equipment, resembling radios, or even analogue synthesisers. The idea that a thought carries with it its own waveform was central to the groundbreaking research of Delawarr Laboratories in Oxford. 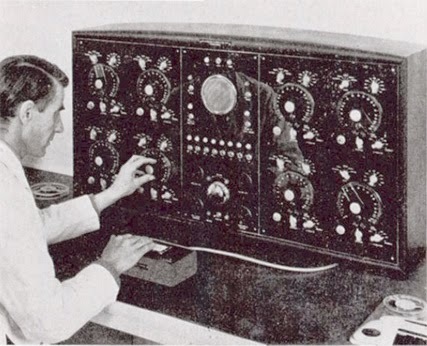 They sought a physical basis for radionics, and in the process, built many powered radionics devices that actually did produce electronic waveforms in a similar manner to synthesisers of the time. The author Duncan Laurie, in The Secret Art, recognised how Delawarr had preempted experimental music: he concludes, "without realising it and with little or no subsequent credit, the De La Warrs had initiated and explored an important venue for artistic discovery". "It appears that thought is a complex vibration in some respect akin to known forms of radiation. (...) With sufficiently delicate instruments it should be possible to analyse a thought, and this in fact is the case. (...) Suppose a thought is held in mind, such as the general concept of some particular disease. If the frequency dial of an oscillator is slowly turned, a stick will be occur on the detector pad at a series of different frequencies. When these are listed they are known as a 'frequency run'." In the mid-1960s, Delawarr planned to broadcast specially devised therapeutic audio frequency clusters into people's homes via a radio broadcast transmitter, but the GPO didn't grant the laboratories a license, and the project was never realised. But now, in conjunction with Resonance FM and Sound and Music, a homage to these experiments is underway. Radionics Radio can be accessed at www.radionicsradio.co.uk. Special thanks to Sound and Music, Diana Di Pinto, Mark Pilkington, Chris Weaver and Ed Baxter. Is the radionics radio application for computers still available? Hi - Radionics Radio was a musical project sponsored by the Sound and Music organisation. The project has concluded now with the release of the CD on Sub Rosa. I have no facilities to host the app and collect frequencies from it now. You might want to investigate the free app PureData where you can build your own variable oscillator.